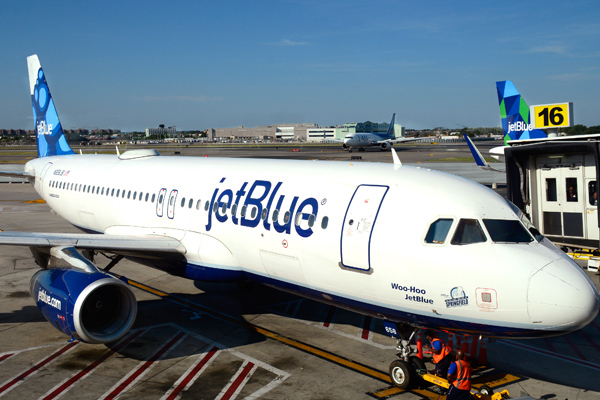 Stop the presses, JetBlue is now our favorite airline! Pay attention travelers, because JetBlue is adding ice cream to their in-flight menu. Yes, really. Summer is coming early thanks to this airline and their awesome in-flight additions. Haven’t you always want to try ice cream in the sky? Well, maybe it hasn’t crossed your mind, but now it’s all we can think about. We wonder if it tastes different in the clouds? Probably not, but it’s still fun. On Monday, JetBlue announced that it will not only be giving ice cream as a new menu option, but it’ll be artisanal ice cream. Fancy ice cream, is the best ice cream, duh. The catch is that this new treat will only be available to its premium class travelers, called the Mint Experience. It sounds like it’s time for us to upgrade to business class ASAP! The coolest part is that depending on your destination, you will get different ice cream brands. The brand will be representative of the location you are leaving, and therefore unique and local. So what can you expect from the ice cream addition? If you’re coming from Los Angeles you will get all-things Coolhaus. The ice cream brand — which started as a food truck in L.A. — is known for its fun flavors like strawberry mojito sorbet or cookies and sweet cream. Cookies not included. Traveling out of New York? You will be able to indulge in cool treats from Blue Marble. Travelers departing from San Francisco will get a scoop or two of Double Rainbow’s best flavors. Double Rainbow started back in 1976 and has been going strong ever since. They have everything from raspberry sorbet to frozen custard. For all of you Fort Lauderdale-Hollywood locals, The Frieze will be the ice cream vendor of choice. Flavors like Indian mango sorbet and vegan coffee ice cream have us wanting to scream in excitement right now. If you’re leaving from Boston, you will indulge in Toscanini’s signature flavors, like B3. What’s B3 you ask? It’s brown butter, brown sugar, and brownie. “These are the local artisanal ice creams you wait in line for on a hot summer night, not the industrial dairy dessert products that you’d find in other premium cabins,” Jamie Perry, vice president of marketing, said in the press release. If you need us, we’ll be flying nonstop on JetBlue and trying all of these ice cream flavors!